The maximum annual contractual rate (ACR) is 25.60%. Flexible loan term options from 12 to 36 months. A minimal one-time processing fee of P1,500 will be deducted from the loan proceeds. Documentary Stamps Tax worth P1 for every P200 of loan amount will apply to loans above P250,000. To know more, clickhere. Example: A loan amounting to P20,000 with a term of 12 months will pay P22,884, inclusive of interest. The estimated monthly amortization is P1,907 with ACR of 25.60%. Compute for your loanhere. 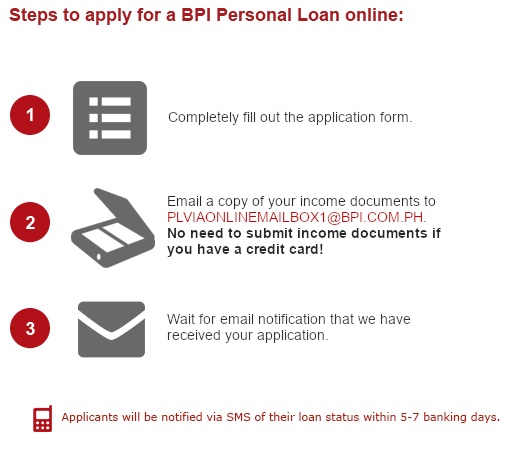 BPI is regulated by the Bangko Sentral ng Pilipinas. For inquiries or complaints, you may contact BPI at 89-100 or the BSP Financial Consumer Protection Department at 708-7087.